Home > Headlines > News > Chevrolet Unveils Rugged Colorado ZR2 in L.A. The Chevrolet Colorado is known for a lot of things, but mostly it is described as a pioneer. When it first launched 10 years ago, the Colorado ignited a fire in the midsize pickup truck segment that had all but burned out. Then, when the current-generation Colorado launched a few years ago, it had the same impact. It awoke the public who was bored to tears with the small truck segment, and forced automakers to up their game. And now, Chevrolet does it again with the all-new Colorado ZR2, an off-road ready midsize pickup truck that can take on any obstacle as soon as it leaves the showroom floor. 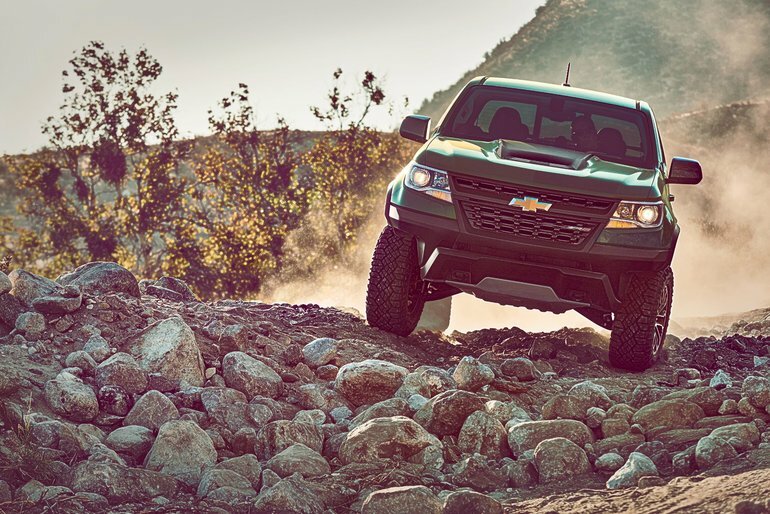 As soon as you turn on one of the Colorado ZR2’s powerful engines (we will get back to those later), you are ready for an adventure. The Colorado ZR2 stands on standard-size wheels, but these are wrapped in beefy 31-inch tires that can handle any rocks, sand, mud or dirt that you throw at them. There is also a reinforced frame which won’t bend under pressure, and a lifted suspension that makes sure you are more than capable of climbing over any obstacle. The Chevrolet Colorado ZR2 also has a wider track than a normal Colorado midsize pickup (+3.5 inches), and some very serious dampers and suspension set up. To test the Colorado ZR2, Chevrolet took it off the beaten path on some of the continent’s most difficult off-road courses including the Rubicon trail, and the ZR2 passed with flying colors every time. The Colorado ZR2’s off-road advantage is derived from its smaller dimensions that mean the truck is more agile and can manoeuver with ease around trees and other objects that will always be in your way when you take the road less traveled. The Chevrolet Colorado ZR2 can be powered by an all-new 3.6-liter V6 engine producing 308 horsepower and 275 lb-ft of torque, or a diesel engine that delivers 181 horsepower along with a mind-bending 369 lb-ft of torque. This allows the rugged Colorado ZR2 to tow up to 5,000 lbs. The new Chevrolet Colorado ZR2 will hit the market this spring, just as the snow fades away and the mud shows up. To learn more about the new Chevrolet Colorado ZR2, contact us today at Bruce GM Middleton.